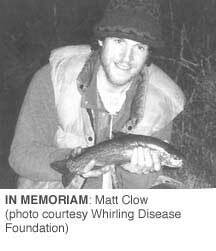 Matt Clow, 30, was fascinated by whirling disease. As a Montana State University graduate student, he wanted to find out why young Arctic grayling and cutthroat trout fall prey to the disease that is spreading throughout the West's waters. In June 1998, Matt Clow drowned after his boat capsized on a lake near Dillon, Mont. In honor of their son, a graduate of Prescott College in Arizona, Clow's parents hope to establish an endowment that supports the fisheries research of an MSU graduate student. They will match up to $100,000 donated to the fund by Dec. 31, 2000. If the goal is reached, $10,000 will be available for fisheries graduate research each year. More than $41,000 has been raised since last June. "Matthew was a bright, eager and promising young biologist who was dedicated to the conservation of native fishes," says one of Clow's professors, Cal Kaya. "The memorial fund is both a tribute to Matthew and an especially fitting way to help continue that devotion." For more information about the Matt Clow endowment, contact Alberta Rivera, at the MSU Foundation in Bozeman, Mont., at 406/994-2053 or 800/457-1696.